From its name itself, the electric skillet is a skillet or a frying pan which is plugged into an electrical outlet. Your traditional skillet is placed on top of a stove to be used for cooking while the electric skillet is electrically operated. An electric skillet may be round or at sometimes square. It is best known to provide an even heating surface and precise heating to avoid burnt food. 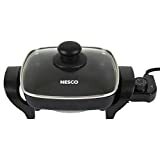 Electric skillets are very versatile appliances and are very useful in the kitchen. Its features include a temperature dial to control the heat level. On the other hand, you can also use it to cook even those sensitive dishes. It can be used for sauteing, pan-frying and more. 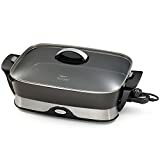 Ultimately, cleaning up on an electric skillet is a definite breeze as compared to a conventional stovetop range or oven. How Does An Electric Skillet Work? The conventional skillet or pan works by placing it on top of a stove to serve as its source of heat to cook food. Akin to how an electric heater or a hair dryer operates, the high voltage electric current runs through a resistor. Resisting the flow of electricity, the resistor produces energy which is then converted into heat. Electric skillets have coils located on its underside which are the ones being heated. The heat will then flow upwards to the skillet surface, thus allowing the cooking to transpire. All of these are controlled by a thermostat. Eventually, the electric skillet does not heat up as much as the traditional pan over a stove. However, its main advantage is getting the heat evenly distributed all throughout its cooking surface. Apart from that, it has features that allow you to have temperature control. 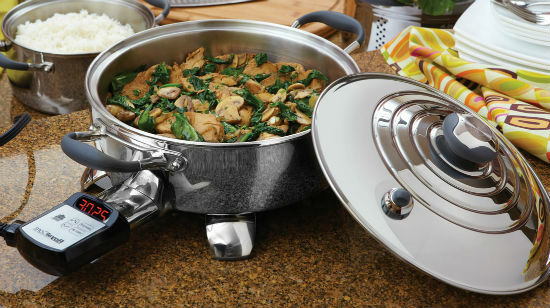 The electric skillet has a variety of uses and is a more flexible cookware compared to a conventional skillet or pan. It can be used to saute, grill, braise, stir-fry or even steam cook food. It can also serve as an additional cookware or at times even a substitute cookware when needed. You can identify the size of an oven based on its slice capacity, but this can be a little misleading. The best method to identify the size and capacity of a countertop convection oven is to refer to its cubic foot measurement. Usually, a 0.6 cubic foot capacity is adequate to roast a whole chicken. With a traditional stovetop skillet or pan, there are often time hot spots which cause uneven cooking. On the other hand, with the electric skillet, the heat is distributed evenly all throughout the skillet’s surface. In this way, your food will cook faster and evenly. The portability of a kitchen tool or appliance, of course, is another thing to consider. 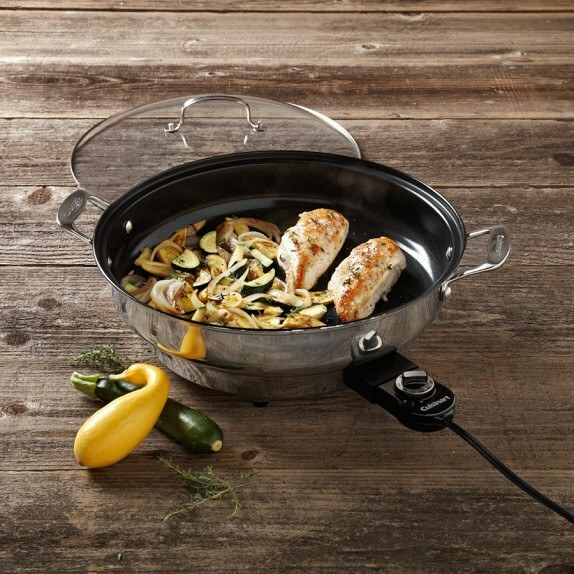 With the electric skillet, you can bring it anywhere as long as the electric outlet is available. If you love to travel or to go camping, you can tow your electric skillet along with you. You can bring it to your folk’s home to cook your very own recipes for your next family reunion. 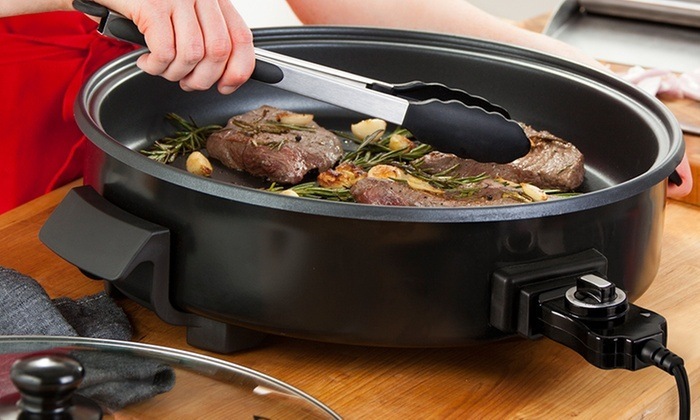 With its compact design, the electric skillet can be stored easily. It doesn’t take up so much space compared to other cooking appliance. It can be placed on top of the kitchen counter or stored under the sink. This suits you best especially if you have limited space in your kitchen or if you are living in a small apartment. Whenever there is a big gathering, it is a fact that your stovetop range often gets too crowded with dishes that needed to be cooked urgently. But having an electric skillet can solve that problem for you by being a stand-in cookware. Not only that, in times of emergencies such as your stovetop range breaks down suddenly, you can rely on the electric skillet to do the job for you. Although it can do the basic task of cooking food and comes with other admirable features, there is also a flaw with the electric skillet. It is a fact that when it comes to cooking, heat is a big factor. However, the electric skillet can’t turn up the heat that well compared to a traditional stovetop. When it comes to buying anything, the price must be an utmost consideration. You always want to find a product that can give you what you need at a price that you can afford. Set aside a budget for your electric skillet and determine the features and functionalities that are important to you. Do not just purchase a product that is inexpensive and would later on compromise the things you are looking for. This could easily end up in regret. Determining the size and shape of the electric skillet is also important. Most electric skillet models come at around 10 to 16 inches diameter. You need to know which is the best size for you depending on which dishes you’d usually cook along with the available storage space you have in your kitchen. The size of your electric skillet will also dictate the quantity of food you can cook and serve. If you live alone, you can opt to have a smaller size electric skillet. However, if you will be cooking for the family, then you should consider buying a larger size. The cleaning method is also an important factor to consider. 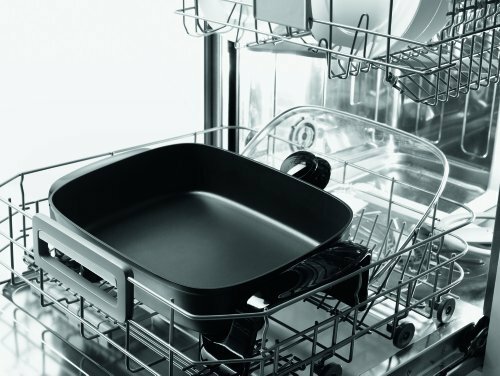 If you view the manual washing of dirty dishes or cookware a daunting task, then it is best to find an electric skillet that is dishwasher-safe. Depending on the dishes you want to cook on your electric skillet, you have to consider the temperature controls. Often, electric skillets have a high and low setting. However, others have a warm setting. If you would like to use it for deep-frying, it is best to look for an electric skillet that can reach 450 degrees. 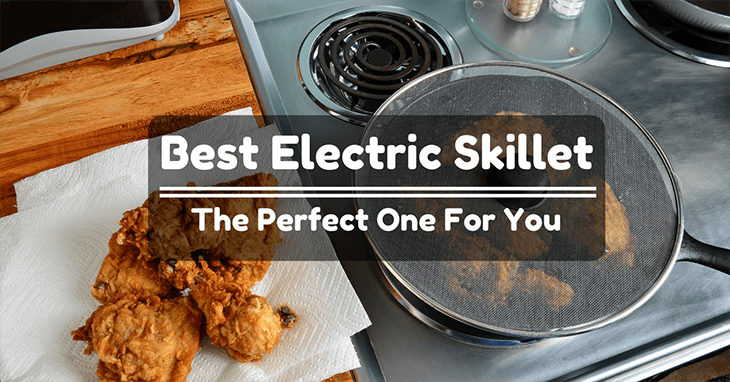 Now that you know the important information about the electric skillet, we can move onto our recommendations of the best there is in the market. Here are the top 5 electric skillets we have found for you. Made from stainless steel and has a non-stick coating, the Cuisinart CSK-150 is an electric skillet that is easy to clean. It has a diameter of 14 inches and a height of 2.5 inches. 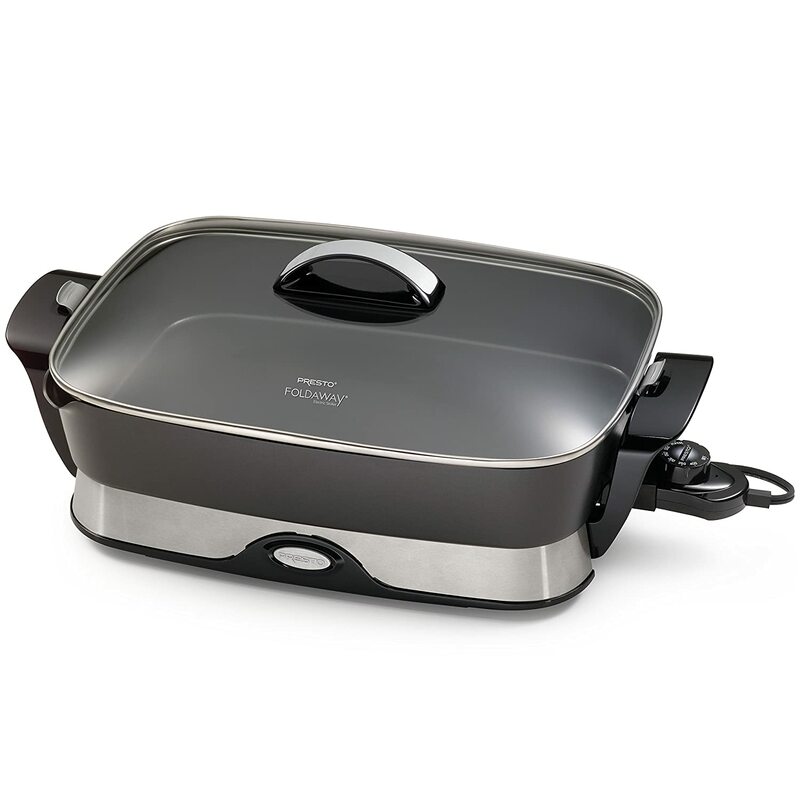 Moreover, its heating capacity reaches up to 450 degrees which are perfect for deep-frying. One of the affordable models out in the market is the Presto 06857 Electric Skillet. Despite the affordability, this electric skillet still gives you the superior cooking needs. It has a diameter of 16 inches and heats up to 400 degrees. It is considered as a very sturdy appliance due to its heavy cast aluminum base. It also easily folds away for storage. And lastly, it has a built-in spout for easy draining of excess liquid of oil. With a die-cast aluminum body and a non-stick interior, the De’Longhi BG45 is one durable piece of cookware. It is 16 inches in diameter with the height of 3 inches. Its tempered glass lid keeps heat and moisture in. Thus your food is as juicy and tasty as ever. One of the great features of the De’Longhi BG45 is its built-in heating element that ensures even and precise heating throughout the cooking surface. 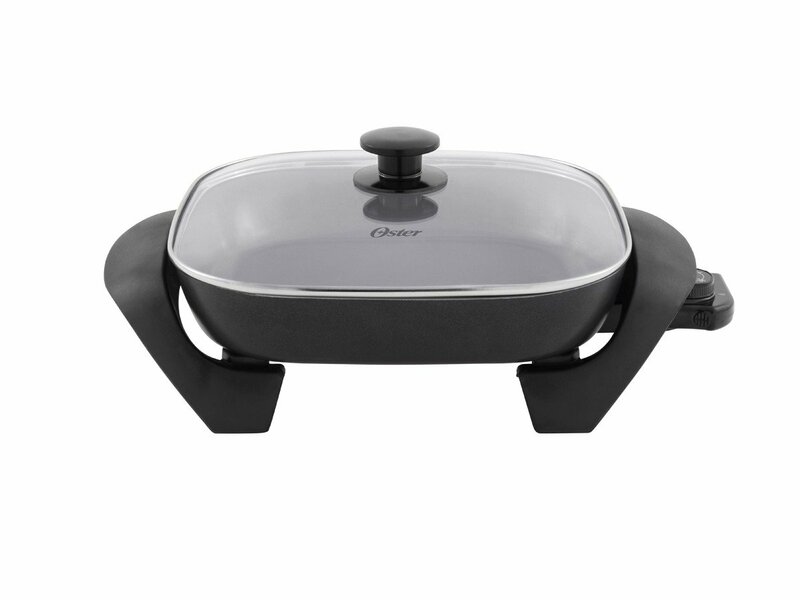 One of the impressive features of the Oster CKSTSKFM12-ECO is its DuraCeramic non-stick coating. This makes it four times more durable and has resistance to flaking or peeling. Another thing is that cooking with a non-stick ceramic interior makes it free from dangerous substances, thus ensures zero health issues. If space is one of the challenges you have, then the Nesco ES-08 is perfect for you. It is a compact and petite electric skillet but does the job of cooking very well. Weighing just 3.8 lbs, it is perfect for traveling or camping events. 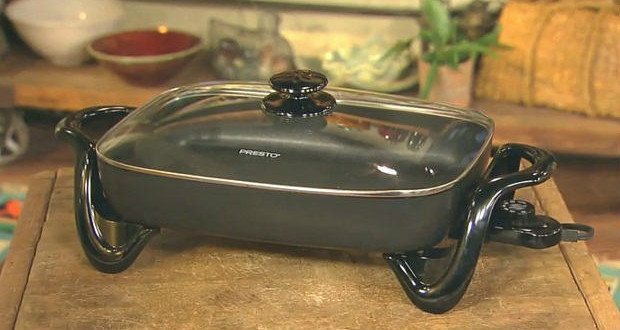 It has a non-stick interior and includes a good quality glass lid. 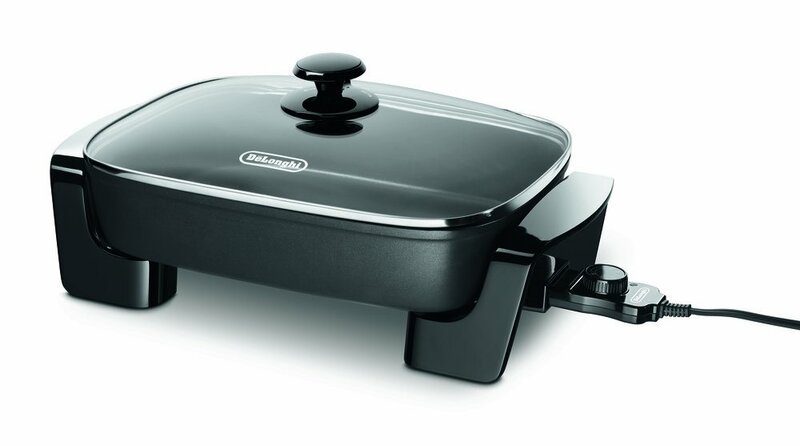 Since it is smaller in size compared to other electric skillets, its body and lid are dishwasher safe. 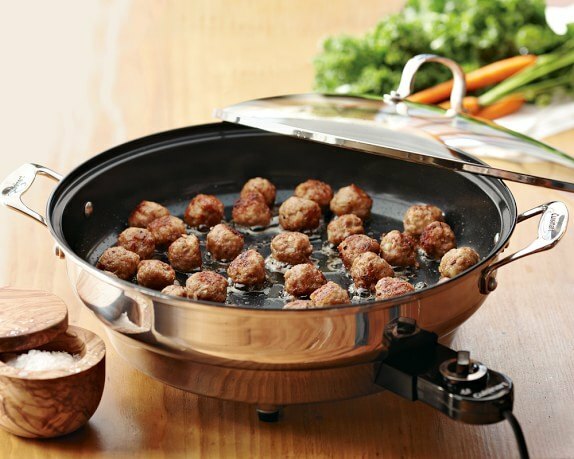 Undeniably, there are a lot of amazing electric skillet models that you can choose from. And over time, many more brands will come up with different modifications to the products they offer. 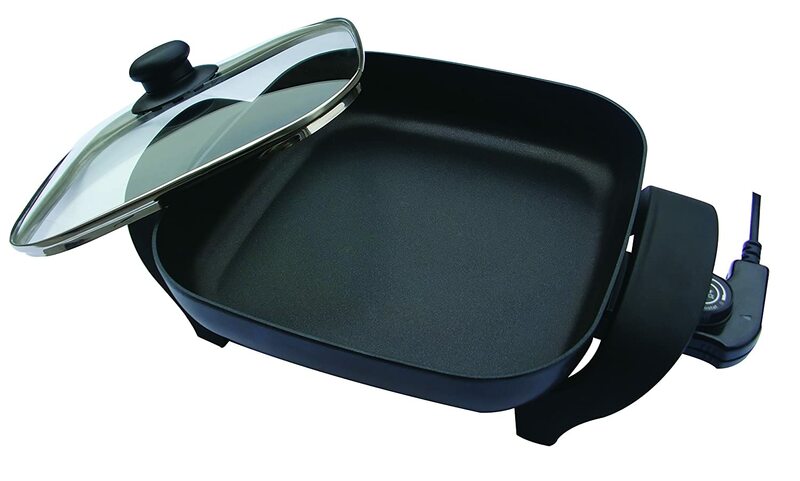 We’re selecting the Presto 06857 16-inch Electric Foldaway Skillet as a standout among our entries. When choosing the perfect electric skillet for you, the most important thing you need to prioritize is what suits your needs. How are you going to use it? Will it provide the cooking style you want to achieve? These may be some of the questions you have in mind. This maybe tricky for you especially when there are many brands available in the market that you can choose from. However, we hope that with this article, we somehow helped you narrow it down if not pick the one that you are looking for. If you have other suggestions or ideas regarding electric skillets or you just would like to share your thoughts about this article, you can leave your comments below.